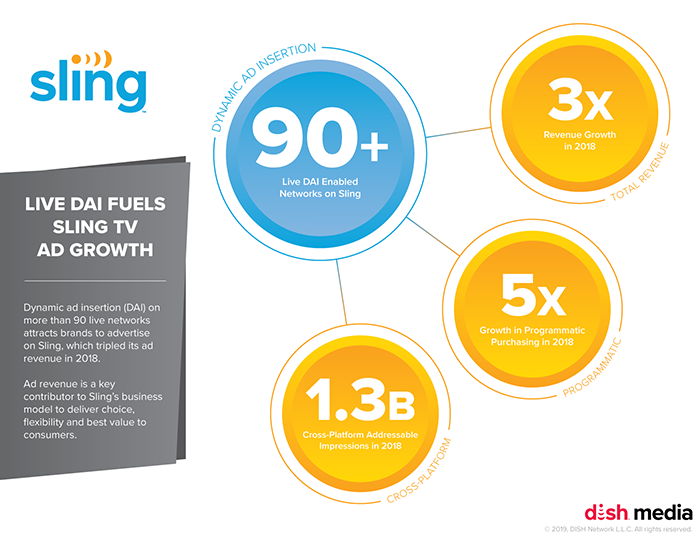 NEW YORK, February 28, 2019 – DISH Media today announced that Sling TV’s industry-leading dynamic ad insertion (DAI) into live streaming TV fueled the tripling of its advertising revenue in 2018, adding a multiplier on top of tenfold growth reported for 2017. Sling saw significant growth in key focus areas enabled by DAI including targeted addressable advertising, particularly in cross-platform campaigns that are delivered to both Sling TV and DISH TV audiences with a single buy. DISH Media has seen growth in cross-platform addressable campaigns since the introduction of that capability September 2017. Sling supports DAI on more than 90 live networks. Programmatic purchasing on Sling saw close to fivefold growth in 2018, contributing to the more than 7,500 individual brands that aired advertisements on Sling’s inventory last year. DISH Media continues its focus on growth with enhanced analytics and measurement. Brands are able to capitalize on cross-platform measurement tools with both comScore and Nielsen introduced in 2018.